So, if you’re into flamboyant costumes straining at the seams of large and elderly men and women, bizarre human behaviour where unimaginable things are done with one’s foot behind one’s back and the nudge-nudge-wink-wink of questionable business practices, well, Buckles has it all. And, of course, animal cruelty and exploitation. Often times, baldly stated. So, there you have it. Bluntly stated. Prince killed. So Prince was killed. Strangulation by circus labourers. I read accounts of two teams of elephants pulling in opposite directions strangling another elephant. Other elephants have been shot, poisoned and one, Mary, was hung by a railway crane. I Loved Rogues: The life of an elephant tramp by George “Slim” Lewis and Byron Fish (Superior, 1978) is a disturbing but fascinating account of how circuses used and abused elephants. One of the most annoying (and telling) things about Buckles is how he always puts the names of the elephants in quotation marks. 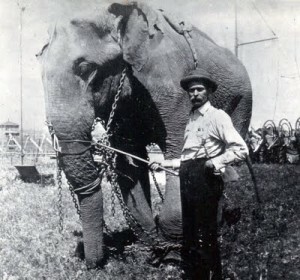 Of course, the names of the elephants were changed, particularly if they became difficult to handle (e.g., Must, the periodic condition when elephants become empowered by chemical changes in their biochemistry), so that the troublesome elephant could be sold on with another name to another circus thereby being freed of any of their “negative” history. But those damn quotation marks are even more annoying than that. They signify the commercial indifference to these glorious creatures as disposable non-entities. Elephants are celebrated as part of the circus life, when it suits, but when it doesn’t, reach for the gun, the rope and the poison. This entry was posted in Animal Rights, Moaning and tagged Animals in Entertainment, Website of the Week. Bookmark the permalink.